It is bound to happen every once in awhile that various theatres in the Twin Cities all decide to produce the same musical within the same season. 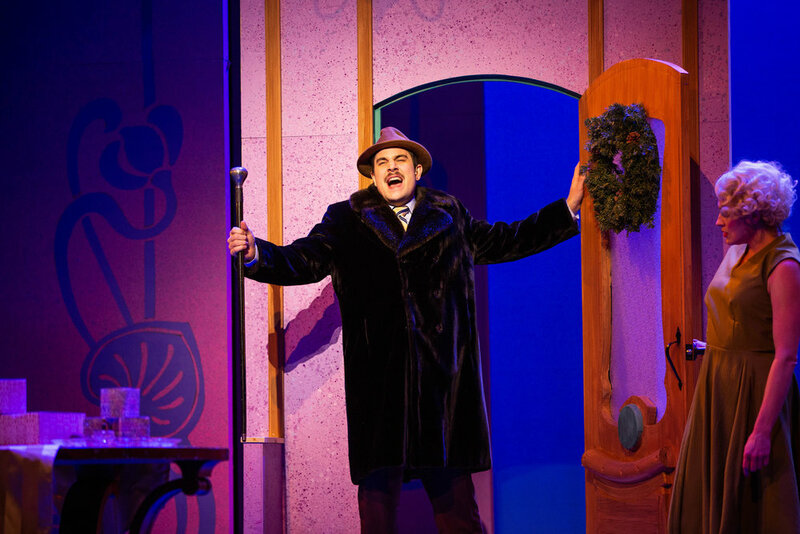 The positive thing is that the other two productions of She Loves Me (one at Daleko and one at Lyric Arts) were absolutely fabulous and the most recent production by Artistry was too. I don’t mind seeing this for a third time within the same year because it’s so ridiculously charming. What I truly admire about this production is specifically how all the technical elements come together in perfect unison The set, designed by Rick Polenek, is wonderfully done and feels modern but still fits the time period of the show. The set and costumes, designed by Ed Gleeman, all come together and are even elevated even more by the stunning and gorgeous lighting design by Jeff Brown. Brown uses a combination of purple, red, and pink colors to create a visually spectacular show. There are many superior performances throughout this show. Upon their first entrance, the ensemble wasn’t the strongest I’ve seen at Artistry before with a slightly pitchy first song however they tuned it up throughout the show. A few ensemble members served as multiple roles as well including Wendy Short-Hays who plays the Headwaiter who strives for a “romantic atmosphere” in her cafe. Short-Hays completely transforms for the part and really captures the stuffy yet comedic parts of the role. While the character Steven Kodaly is a total sleaze, Benjamin Dutcher makes him still devilishly suave to the point of almost falling for liking the character until you get snapped out of it. His voice had a seductive yet charismatic quality that was heavenly to listen to. The male lead, Georg Nowack, is played by Ryan London Levin and I think he was perfect for this role. I previously saw him in Artistry’s production of The Last Five Years and I have to say I was widely impressed with his performance in this one. Levin tone in numbers like “Three letters” and “ She Loves Me” was so bright and smooth that it soars across the large theater. With this musical there is something I never get sick of seeing and that is the women of this show and the way they are written. It’s so refreshing to see a musical in which the lead females are strong and independent in their own way. I recently wrote about in my Carousel review how so many older musicals write women as submissive roles. While Ilona and Amalia are still looking for love, they are not afraid to stick up to themselves against the senior employees. Sarah DeYoung, as Amalia Balash, and Gracie Anderson, as Ilona Ritter, compliment these roles incredibly. DeYoung’s gorgeous soprano voice is so angelic and agile that it is one of the best I’ve heard. She quickly and effortlessly moved through the notes and her quick wit made the part of Amalia a lot funnier than I think most people are aware of. This was the first time I’d seen Gracie Anderson as well in a role after seeing both the first and remount of Always...Patsy Cline at Lyric Arts. It was nice to see her in a different role and it showed her range off beautifully with her powerhouse of a belt and also comical moments. 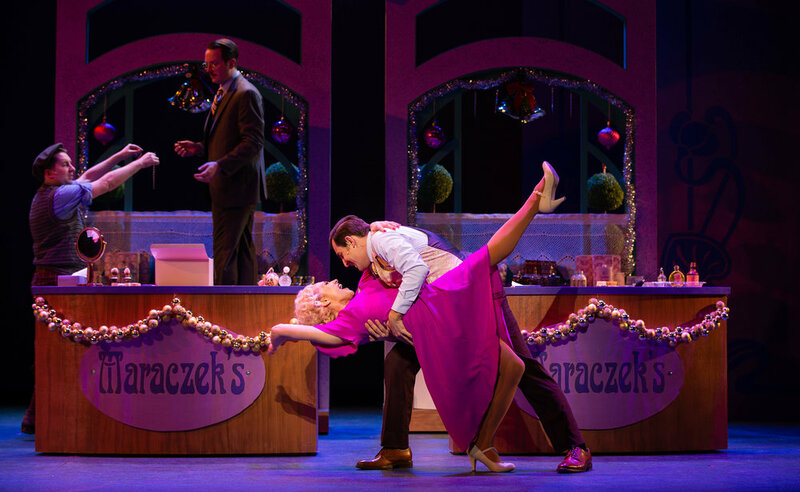 The most recent production of She Loves Me solidifies Artistry's commitment to producing quality musical theatre that should be seen by as many people as possible. They know what shows work and can put together incredible casts that continuously blow me out of the water every time I see them. *Summary of She Loves Me taken from my Lyric Arts review.